Author of “I’m Not Hanging Noodles on Your Ears”. Researcher into the less logical aspects of language. Collector of amusing & intriguing expressions. A collection of 1,000 funny and intriguing expressions from around the world. These odd sayings say a lot about the cultures they come from and say a lot about how odd the human mind can be. Why do we say "I'm not pulling your leg"? Or "he kicked the bucket"? I don't mean etymologically, I mean logically. Why do we use idioms? 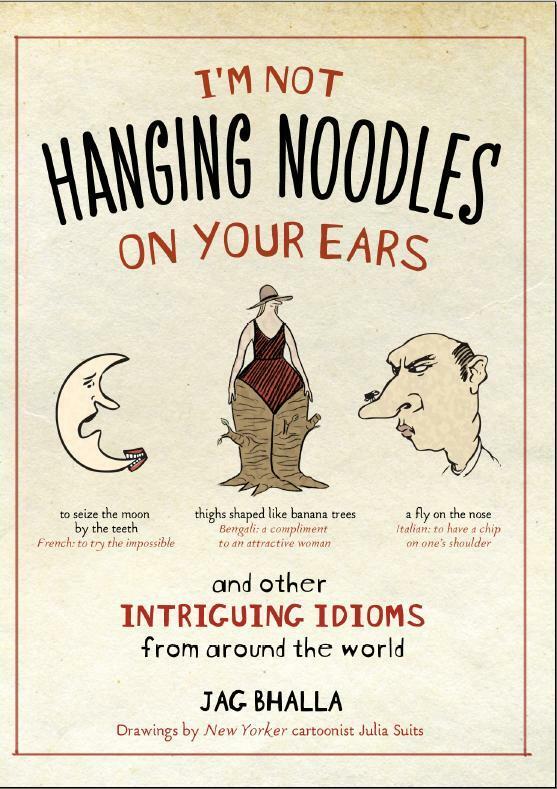 I became fascinated by that question when I discovered that Russians say "I'm not hanging noodles on your ears" when they're not pulling your leg. To us that sounds ridiculous. But let's face it, our idioms don't have a leg (pulled or not) to stand on either. They're just as nonsensical. And they're not alone: To seize the moon by the teeth: attempt the impossible (French). To reheat cabbage: to rekindle an old flame (Italian). When the crayfish sings in the mountain: never (Russian). Cleaner than a frog's armpit: to be poor, broke (Spanish). Sadly I'm enviously monolingual.I have to admire these lingustic gems from afar. However, my linguistic longings and shortcomings have not been in vain. For the slake of my fellow semantic thrill seekers, I’ve started dealing in fresh foreign phrases. I’ve collected some of the most novel (new to the English speaking ear) and intriguing expressions from ten languages. They’re published in an easy to score book. It can save you the decades of effort otherwise needed to actually learn the ten languages themselves.